I'm excited about today's interview. I have been following Liesl at A Little African Magic for a while now. When I first discovered her blog I enjoyed reading about a part of the world that I know nothing about. Liesl is a horsewoman who lives in South Africa. There is an interesting cast of critters that call her farm home. The common black snakes that appear in our garden or in our chicken brooder are nothing compared to the Pythons and Cobras there! I enjoy reading about Liesl's farm and family life. I hope you enjoy the interview! Stonecroft Farm is a 21 hc piece of land situated slap bang in the middle of the orange country of the greater Letaba Valley. The Letaba river runs very close by us,about 2 km away..We are blessed with an abundance of water and easy access to our farm from the main road. We have lots of wild and birdlife to watch here. The farm has two creeks running through it,even during the dry seasons...We have mainly riverine bush type vegetation here,which includes trees like Matumi,wild figs etc.Wildlife here would include hippo,duiker,bush buck,guineas,bush pigs. In the Game farming area a little further on, (less than 6km away) you would find all of the Big Five! What animals do you have there? How do the animals get their names? Have you always lived in Africa? Yes, I was born in Skukuza,which is one of the main rest camps of Kruger National Park and grew up in the Park. One of the entrances to the National Park is only 70km away,so I still live close by to where I grew up. I know you're an experienced horse-woman. How long have you been riding? I have been riding since I was five years old but only got my own horse at age thirteen as we weren’t allowed to keep any horses in the Kruger National Park,for obvious reasons! Only years later did the Park’s Board allow a riding school in Skukuza. I went to school in the town of Phalaborwa and kept my horse “Chiquita” stabled there. I have competed at show jumping, dressage, eventing ,showing, saddle breds and have found endurance racing 5 years ago, but have only been competitive for the last three years! Tell us about the horses in your life now. We are blessed to have several champion endurance horses currently, all have the “Stonecroft”prefix. Ghost, Snapdragon, Red Cockade, Nitro, Radja, Sun Jewel, Bughatti and High Five. Scooby-Doo, Bo Jest, Tinkerbell, and Goomba are used in the riding school. Cockade and Nitro have been sold on just this past week and we have also acquired two stallions, Cadiz (Anglo-Arab) and Blade (BoerperdXArab), which are both scheduled to be gelded asap! I keep seeing "only in Africa" on your posts. Tell us a little about that quote. When I started this blog I wanted to make sure to impress on my readers about life in Africa as it is and the way I experience it in my day to day encounters, so every now and again I would post about something so typically African. I do feel blessed for having the life I have in South Africa and although I often dream of living in America and visualize myself doing barrel racing and riding the Tevis Cup, I think those winters would kill me! Do you garden, cook, or can? I do love to garden although the goats and horses like to eat my projects whenever they manage to escape their field! I tend to stick with no-nonsense type plants like cycads, shrubs and very hardy indigenous plants. I have a very soft spot for all kinds of herbs and always have quite a few of them. Basil, parsley, chives, mint, and coriander are definite must haves, as are tomatoes and lettuce in the veggie category. I do like flowery plants, but sometimes forget to water them as often as needed! I absolutely love to cook and can happily while away any spare time cooking meals. I have been checking out this canning thing on other blogs but I am sure to blow up my kitchen, so I have been “angling” at it a bit! Yum! What time did you say I should be there for dinner? Here in the Eastern US we have certain wildlife pests. We have foxes, groundhogs, raccoon, possum, and skunks. What are the pests where you farm? Snakes, snakes, and snakes!! Pythons, cobras, and black mambas to name a few. The thing is that cobras and mambas are extremely venonemous and a bite can so easily kill you, especially if you happen to be alone on the farm and can’t get to a phone in time! A black mamba bite kills in a matter of minutes and they love to come inside the house! On a lesser note we have vervet monkeys but they really don’t bother us much, it would be a different story if we farmed with fruits though, porcupines, cervals, caracal, and cerval. Last but not least are the midges which carry the feared African Horse sickness. Luckily they die off after the first frosts and we normally have a few months' break of worrying about our horses getting sick. What's the best thing about living where you live? Being able to hop on my horse at home and ride for almost 40km along the Letaba river,and through the most beautiful orange orchards, or loading them and driving 15 minutes to the picturesque mountains in the Haenetsburg area. It's always cool and breezy whenever it is hot and humid on the farm. Being able to stand in my kitchen and watch all our horse in their stables at night is another of the best things about living here. What's your favorite thing about farming? Other than the horses I would have to say the sheep! They don’t kick or bite and like to have conversations with me, especially at feeding times! What's in the future for your farm? Building the sheep flock up to 500 ewes and starting with broiler chickens and free range eggs! 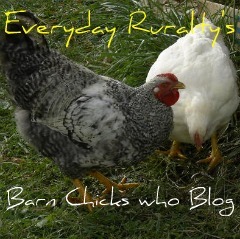 ,Cules has just bought me ten Rhode Island Red, point of lay hens and I am totally hooked! Liesl- Thank you for the interview. I'm sure everybody enjoyed visiting you. I look forward to hearing more about your life in South Africa. Don't forget this is the last day for the cookbook giveaway(6-14). Great interview! I am facsinated with S. Africa! It looks like such a magical, beautiful place to live. I can't wait to check out Liesl's blog! great person to interview. i love liesl and the life she shares with us. she's got so much going on! Fantastic. I loved reading about Africa and I love the shot of the helicopter. I can see why you are hooked. Though I wondered if a Black Mamba gets in your house how do you get it out? That was so interesting. It gives a new perspective of Africa. The thought of black mamba's make me shiver though - Yikes! Thank you for this great interview. I can honestly say I have never considered a farming life in Africa! How amazing is this that you connected. Loved everything but the snakes. And I will never go anywhere near there. Because of the snakes. I hate those things. If one came near me it would not have to bite me, I'd die of a heart attack. Thanks for this great interview with my blogger friend, Liesl. It is so interesting to read about her life in Africa and you captured so much of it here. I follow her blog and this is a very good interview. Thanks. I, too, follow Liesl's blog. I enjoyed this interview very much and learned a lot about her.